Will adding more RAM increase your SSD's performance? Can using more RAM increase the performance of your SSD over time? More RAM is a perpetually tempting prospect. It's one of the cheapest upgrades you can buy for your system, and (in spite of what the man in PC World will tell you) the easiest to install. The benefits of going beyond 4GB of memory have thus far remained nebulous. A system packed to the rafters with RAM isn't going to yield higher frame rates than a skinny 2GB machine, nor is it going to feel zippier when running a single application at a time. Traditionally, the view has been that more memory is only useful if you switch between several demanding apps regularly, or insist on opening eight browser windows, each streaming a different exciting episode of Deep Space Nine at 1080p because, you know, technology. 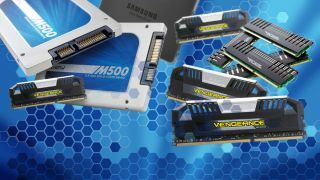 Now that SSDs are fairly commonplace in everything from weekend warrior laptops to water-cooled overclockers, there might be completely new benefits to running a RAM-heavy rig. Does having enough memory let you turn off the Windows Page File and save your SSD from unnecessary writes without risking system wobbliness? Performance degradation over time can be a real issue for solid state drives, so the potential benefit's considerable. Then there's the idea of using the RAM your system isn't using at its peak memory usage (which will be quite a lot in an 8GB system) and turning it into a virtual RAM drive to be used as a scratch drive. Low latency gaming modules will not only deliver some lightning reads and writes, they could also take the load off your SSD in instances such as image or video editing when your editing software's constantly caching your steady progress. But how tangible is that gain when you're working, and is it worth the risk of running out of available memory? Windows doesn't hang around to tell you what went wrong at that point - it's outta here. So say bye bye to any unsaved progress. Join us as we contend with the many pitfalls of page files and ruminate the reads and writes of our beloved RAM drives, finding new and intricate ways to boost and reinvigorate your SSD, so you don't have to. Performance degradation is a sad thing. When this tester first got his 256 GB Samsung SSD 830 over a year ago, it had stop-and-stare IOPS. Out of the box its incompressible reads/writes were around 500 MB/s to 400 MB/s, but after a year of heavy usage as a primary boot drive, you can go ahead and whack 100 MB/s of each of those figures. Ouch. There's a metric tonne of information out there in the internet wilds regarding proper maintenance and performance tweaking for your solid state storage, and one increasingly popular hypothesis is that you may be able to harness surplus RAM and send it to your SSD's aid. With 8 GB of G.Skill Ares 1600MHz DDR3 memory sitting beneath our chassis and a 64-bit Windows install so every GB of those modules could be put to use, we thought we'd test the theory. Our first port of call is the page file. When you're running low on physical memory on account of those eight Deep Space Nine HD streams running in unison, Windows starts moving your most infrequently accessed memory pages onto the root directory of your hard drive, freeing up any physical memory space. When that drive happens to be an SSD, that means Windows is performing a lot of writes, which degrades flash memory over time. Logic would seem to dictate that if you have enough memory in place, Windows doesn't need to reallocate resources away from it and you can save your SSD the stress by disabling the page file.